Mac OS X 10.7.3 update was just released, and for the vast majority of users the update installed trouble free. 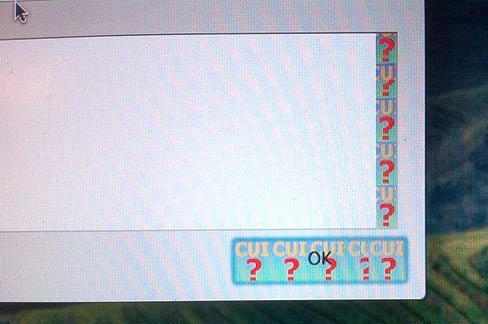 But not everyone was so lucky, and a series of problems have cropped up for some users, ranging from being stuck on an endless spinning loop progress indicator, to apps crashing nonstop, to a very bizarre “CUI CUI CUI” error screen filled with question marks (seen below), to other strange behavior. The good news is these problems are relatively easy to fix. Basically all you need to do is install the OS X 10.7.3 Combo Updater over the existing messed up installation of 10.7.3. The bad news is that if you already updated to Mac OS X 10.7.3 and you’re having problems, you’re going to have to find a way to use the Combo Updater over the troubled installation. If you’re just encountering the CUI errors, this is relatively simple, but if you’re stuck on a boot loop you need to get a bit more creative. Not the best situation, but hopefully you have recent Time Machine backups. Finally, if you’re reading this and haven’t had any problems but you’re now paranoid about the OS X 10.7.3 update, here’s all you need to do to be safe: Backup your Mac with Time Machine, download the Combo Updater and install the update manually. You’ll almost certainly be fine. Thanks to Erik, Martin, and Apple Discussion Boards for the tips. Chime in if you have any additional info. Mac OS X 10.7.3 Combo Silently Updated? Good timing. I just went through this and here is what I learned. The crashes only impact the GUI, thankfully I had SSH server on and was able to manually apply the update through CLI. If you do sudo softwareupdate -l and find “PackageKit: Missing bundle path, skipping” errors I think the upgrade is going to have problems. Anyhow, force the update with sudo softwareupdate -iv MacOSXUpd10.7.3-10.7.3 through SSH and it booted fine again. Damn. I’d tried launching my terminal to see what could be done, and it wouldn’t launch. Unfortunately, I didn’t have the SSH server activated, otherwise this would’ve been a great solution. – Visit http://support.apple.com/downloads/ and download the 10.7.3 combo update [direct link]. - Quit Safari after the combo installer is successfully downloaded. – Open Disk Utility from the Menu bar, choose “Open Disk Image” from the File menu and select the combo installer from where you saved it. – Quit Disk Utility after the volume is mounted and apply the aforementioned Terminal commands. – Boot into the Recovery partition by holding down the Option key at startup. – Choose “Terminal” from the Menu bar and run “installer -pkg /Volumes/Mac\ OS\ X\ 10.7.3\ Update\ Combo/MacOSXUpdCombo10.7.3.pkg -target /Volumes/Macintosh\ HD” (Change the target to reflect the startup volume’s name.) Be patient, as it can take up to 15 minutes or more to apply the combo update. – Run “reboot” and you are done. Super Hans, if you are ever in the Tampa area I owe you a beer! Freaking brilliant. You saved my day, thank you very very very much! @ Super Hans: another beer is waiting if you’re ever in the area of Leiden (the Netherlands). I never fiddled with this boot menu yet; your instructions saved me a lot of hair-pulling. First of all, thanks to everyone here that contributes. Without the community support so many of us would be left drowning without a liferaft! I’m not someone that uses Terminal on any kind of regular basis. I’ve managed to get the image mounted and ran the Terminal commands. I have what appears to be feedback that the installer is running: “Package Name” and “Upgrading at base path” messages, followed by 7 “Missing Bundle Path” messages. So, from here, how do I know what’s happening? Is there a way to know if it’s failed or complete? There’s no other feedback on the screen and I have no idea what to do next. Thanks. I experienced the problem and was able to boot from an external hard drive running Lion, downloaded the combo update, updated the main hard drive, my system is back working again. Whew. I wish I had been warned! No more quick updates for me. I’ll wait until someone else tries it. Didnt realize you could do an update like this. I have the same problem. In the process of creating an external Lion install to see if it works for me as well. Thanks for sharing the solution. I updated without any incidents, now I consider myself lucky! So this may account for some of the trouble, the version of OS X 10.7.3 is the same as the last developer seed build 11D50. Maybe they pushed the wrong build? Why release a developer build then wait a week before pushing without any additional updates? Seems a bit weird. Anyway, I’m up and running on 11D50 trouble free. Lots of little changes to the OS. Updated (to 10.7.3 on the MacBook Pro and iMac) straight away, no problems so far, lucky me! But if you use Monolingual you can recuperate 900 MB of space. I do not get what you mean? can you explain how you free up 900MB>? By the sounds of it there are 900mb of new language files. Monolingual goes through and removes all the language files you don’t want. Ah Got you, Thanks Chris, how do you run Monolingual over the DMG? If you use Monolingual to remove most of the languages that you don’t need/want, you will get back about 900 Mb of free space. I don’t find very normal that in an update 90% is only for languages. It would be better if it would be possible to chose what languages to install before to download the update. Think that some people have to pay for any bite that they download and/or have very slow internet connection too. I haven’t updated to 10.7.3 yet. Should I just go ahead and download + install it anyway or install the combo updater instead? Yes, download and install the combo updater manually. It works flawlessly for me (10.7.2->10.7.3 on MBP 2.3GHz i5). Thanks snguyen, you’re right it works just great! I’ve installed it on a MB 2,4 GHz Intel Core 2 Duo. Client Combo Means you can do : 10.7.0 -> 10.7.3 straight away as it contains all fixes from past. If I have 10.7.2 version can I update using the client combo update? I believe the main culprit is ” little Snitch”. A firewall app. That’s not compatible with 10.7.3. Installed in their system, please uninstall that before updating 10.7.3. This update is absolutely absurd. it is unacceptable that Apple releases a apdate that gives this type of problems. I spent all last night to restore my iMac! I could not even boot the Mac from the keyboard … In fact, the keyboard is disconnected at startup and would not accept any commands. I solved by connecting a USB keyboard of my old windows PC … mortifying! Used the combo update but still crashes system preferences when using smart card reader. I made the mistake of transferring lion back to the main HD; I will re-clone snow leopard back to the main HD using cc cloner. Lion still not ready for the big house yet; it will be banished to the external hard drive yet again! I had that problem, when I did. I reloaded the third party smart card project. O think apple is somehow involved indirectly in the apps dev. used the link below, smart card now working. Appreciate the link. I tried it over the past half hour opening and closing system preferences and then going opening the “start-up disk” pane and so far it has not crashed. I will test it over the next couple of days. It appears that this fix was released in August; wish I had known about it earlier……Though, I have not otherwise noticed any performance gains with Lion over SNL in general so not sure that I am ready to adopt Lion but this help irons out an annoying problem. Thanks! Unfortunately, system preferences “start-up” disk pane is still crashing system preferences. I guess the smart card project was not the answer but thanks anyway. I am supremely disappointed in Apple; although I was thinking about purchasing another 27 inch iMac that seems less likely at this point. I will wait for the next update and see what happens. Beginners Question, please help… I can still boot my macbook air. So i downloaded the combo update via another laptop and copied it to a usb stick. But how can i now install the combo update on my macbook? How do i start the DMG file when finder is crashing all the time? PLease help. Could you provide an example of how to “change the target” for example if my startup disk is named “Boot Disk” what would the terminal command look like? Like this? Wow! Thank you, thank you. I was up all night trying to fix the CUI CUI CUI problem on my new install of 10.7.3. I was able to successfully update my other three computers running Lion. But the update made my Mac Pro unusable. I’m downloading the combo update now. I’m still holding my breath but I now have confidence this can be fixed. You should press the alt/opt-key instead. No problems here with the software update. Jusit installed this & now my macbook is slower than molasses & it’s not even January anymore! I think you’re far more likely to have problems with the combo updater in the general case. It’s used a lot less. Use is what uncovers bugs. But doing a Time Machine backup before applying an update is great advice. Mac Restart and boot with the alt key and hold. You get into the boot menu of Mac OSX. Now the installation lasts about 5-10 minutes. Mac restart and then everything should work! I do not understand this passage: “You get into the boot menu of Mac OSX. Now start the terminal on the top bar.”. If I boot holding the alt key I can see the volumes and the wifi connection but how can I start the terminal? I don’t see any bar on the top of the screen. I am not great with Terminal so I don’t know what that necessarily means. I don’t know what the issue is, I was copying it straight from what Adrian typed up. Someone please help. and after a while the installer exits. okay i discovered that checksum of the updater did not match the sha checksum expected. Maybe there is somethin odd in the borked 10.7.3 system im currently running..
ok created a ramdisk. put it on the ramdisk. yeah checksum okay. installer installed everything so far. Here lies the problem of having the M.A.S. as your source of applications O.S. and updates. Besides the added complication and confusion, where is the emergency start up disk to bypass the problem? It is a total half baked mess. The other thing is how on earth does Apple justify 1.2Gb for such a pathetic set of updates? I have booted from an external drive, started the combo update installer, and attempted to install to my machine’s hard drive with no success. The problem is it is not counting my machine’s HD as a Lion drive. Any ideas short of wiping my drive? Ran the 10.7.3 combo updater, not the software update and I have no problems. Always do a backup before running any system updates. Verify your drive using disk utility so you know your drive is healthy too. Please help, is this because of disk write privileges? If I only manually downloaded the combo update ….am I good to go, or should I have upgraded via software update and then manually installed the combo? Do you think Apple will fix the update so that the problem is resolved or are they likely to issue a 10.7.4 which will allow me to install over my current 10.7.2 ? The combo updater solves the problem, so I think they will recommend people use that and then find the fix and seed it as future 10.7.3 builds. It’s unlikely we’ll see 10.7.4 anytime soon though when they can just push the fixed 10.7.3 build. I agreed to pay more to get reliable products. I was one of the lucky ones to get “cuicui” message – it didn’t make me hilarious at all. I guess Apple is no longer as trustworthy as it used to be, more and more updates, more and more crashes, it gets closer and closer to Microsoft, just that the price is different. The installer froze when I updated to 10.7.3 on my MBP (worked fine on my iMac). I rebooted, and downloaded the Combo Updater (yesterday evening UK time) and ran this. Still had the same problem with the installer freezing at the point of “moving items into place”. It has been frozen for nearly 3 hours. I will leave it alone for a few more hours to see if anything happens (there has been no movement on the progress bar, but the “install time remaining” message has changed from “about 1 minute” to “about 6 minutes” and now reads “about 11 minutes” – these changes seem to happen every hour or so. Next thing will be to re-try the Combo Installer in Safe Mode. One question – exactly what do I need to restore from TM? the full Macintosh HD? or a subset of folders / files? Should I download the Combo Updater again to ensure I have the latest version (the updater I have is called MacOSXUpdCombo10.7.3.dmg)? after over 8 hours of it being stuck at “Moving items into place”, I gave up, rebooted the MBP, downloaded the Combo Installer again, and re-ran the Combo Installer. Once again it got stuck at “Moving items into place”. After 3 hours I gave up and terminated the install using Force Quit, rebooted the MBP, ran Repair Permissions and Verify Disk (no issues), and re-ran the Combo Installer. Once again it got stuck at “Moving items into place” with the remaining install time at “about 1 minute”. This didn’t change for over an hour, when suddenly the installation completed successfully, and I restarted the MBP to complete the installation. All looks good so far. Not sure what I did to fix the problem, nor indeed what the problem was, but fingers crossed that my applications will run successfully when I try them in the morning. And here I thought that you paid a premium on a Mac so you wouldn’t have this type of trouble. My installation has been stuck at “moving things into place” for the last 5 hours and I am not sure what to do. It’s really frustrating that people have been complaining for the past few days but Apple leaves the update there to be downloaded, with more and more people having problems. It’s really unacceptable. I am very disappointed. Since updating to Lion I have had nothing but grief. I waited months to update from Snow Leopard, but I shoul have waited more. Ever since upgrading to Lion I had various problems. Then on Feb 8th it wiped my hard drive, wouldn’t let me re-install anything, and refused all of my external drives. After 3 hours in the Apple Store yesterday afternoon, the “Genius” got Lion installed after repairing the hard drive permissions then he sent me home to do the updates myself. Now I’m at update 10.7.3, along with 6 other updates, and it won’t install. I get a message saying there was a download error and none of the 7 updates could install. What blows me away is that the people at the Apple Store acted like all this was just a freak thing and they didn’t have a clue how it all happened. With the volume of people that go through the store on a daily basis, they had to know it was all caused by Lion. I’m hoping this Combo Update will fix my early 2010 MBP. So looking at the errors, if the combo updater works, then the error is possibly not in the updates, but inthe installer, either installing inappropriate updates or not completly installing the correct updates. My Imac 24″ crashed when I installed 10.7.3. – stuck on an endless spinning loop progress indicator. I installed the startup disk and unplugged the computer for 24 hours. Voila it is now working and I’m now installing the combo update. Please note, I found this solution because I don’t have the faintest idea about programming. I hope this helps in figuring out what caused the problem. I just installed Lion, my problems were with interrupted installations that wouldn’t then allow me to further install but an apple support lady sorted it by getting me to set up a new account on my computer and doing it from there, the installation went okay and all seems okay. Have the problems been sorted or do I still need to download combo update? I had a problem after my update where it just wouldn’t mount my OS X partition and took me straight to the recovery partition. It did however (and I wouldn’t expect otherwise) show my bootcamp partition. I opened the Disk Utility and ran a repair disk and it after it was finished (found a few problems) it booted right up and no problems. This may work for some and is a good first step as it did work for me. Trying to update the new combo installer from USB device but cant mount says it doesnt recognize the file…what am i doing wrong…in terminal it says it does not exist..this is such a headache! What file system are you using on your USB? I did a system reboot after applying the 10.7.3 update, and now all I get is a picture of an apple etched into a matted grey desktop screen. No user login splash screen… Please help, Urgent!!! Hold down Shift key to boot into safe mode, see what happens. Many thanks, I totally forgot about booting into safe mode… problem now resolved cheers. It is set at fat32 already….switch to hfs? i am stuck badly with the macbook. i am ready to loose everything from my harddisk. still not able to reboot. not able 2 move ahead from spining wheel. it is of ? folder error, which is happening. hardware seems 2 be fine as i have run the hardware test. moreover i dont know much about these things. it shows 0xe error during manual boot. Need help im having software updates for lion and when it was for reboot it took soo long. And i can only see a moving circles but no apple icon.what shall i do? Originally i had SL then install Lion then update software. But before my updates i experience random shutdown. I need help because, I was trying to change the snow leopard theme into the black one and when i uninstall the snow leopard version and after it finished uninstall i accidentally log out my mac and then when i log in again i couldn’t open any of the apllications on my mac even the finder. do you have tips or or something that i can do to fix it? it would be a lot of help thnx. I’m in an endless loop installing Lion. It starts the installation, but after a couple of hours (more then 10) is doesn’ progress anymore and it stops with a message : an error occurred while installing Mac os x.
I have a timemachine backup from Leopard. Then I installed a new HD, installed Snow Leopard from the DVD I bought and then I bought an downloaded Lion X. And this is where I am now.. Any suggestions what to do ?